It is with great excitement, to introduce our Summer Scholar Spotlight, Brione Griffin. This past summer, Drew Scholar, Brione Griffin completed a research program at the University of Illinois Urbana-Champaign. She participated in the Research and Education for the Advancement of Compassionate Healthcare (REACH) program where she worked with Dr. Rashid Bashir. Her research focused on multiplexing protein analysis in order to develop a point of care device that detects biomarkers for sepsis. On top of completing research, she had the opportunity to shadow several doctors at the Carle Foundation Hospital as well as sit in on a couple of surgeries. At the end of the summer, she was able to present my research at the Illinois Summer Research Symposium. 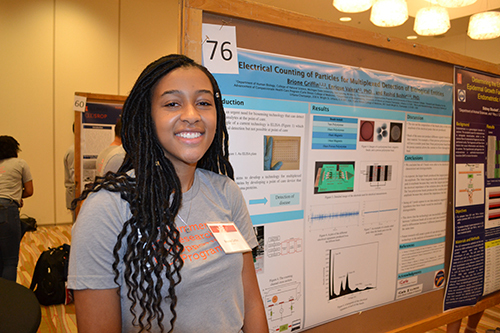 It was a very rewarding summer and she had an article written about her by the I-STEM coalition at U of I! Congrats on your new experiences! Great job! It is with great excitement, to introduce our Summer Scholar Spotlight, Marcel Coleman. Marcel Coleman is a sophomore focusing on a major in Biomedical Laboratory Diagnostics (BLD) with an emphasis on pre-medical tracking. Marcel is interested in pursuing a Master of Healthcare Administration and becoming a MD physician making an impact through serving in underserved communities. He enriched his summer experience by participating in the University of California Los Angles/ Charles R. Drew University School of Nursing Summer Health Professions Education Program a.k.a UCLA/CDU SHPEP, which is committed to developing future leaders that will change the face of medicine and dentistry as well improve health care delivery, policy and research in underserved communities. He explored cardiovascular disease research within the Latino community in South Central LA with fellow interns and dived into problem based physiology and anatomy courses with simulator manikins (see image below). Each week during the 6 week program, his team received an educational challenge to to diagnose patients using the information from their lecture and outside resources (Pubmed, NCBI, etc). In addition, Marcel is a member of the MSU Honors College. We would like to introduce our summer scholar spotlight, Emily Washington! Emily Washington is a senior with a major in Human Biology. Her ultimate career goal is to be a journalist, physician and health educator focusing on preventive medicine and global outreach health specialty care. 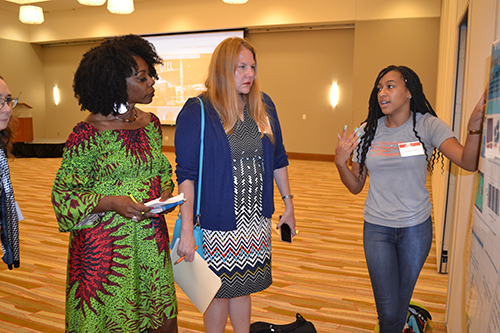 During her summer, she had the opportunity of working with the American Osteopathic Association to plan and coordinate a symposium with the CEO, Adrienne White-Faines, for the OMED 2018 Conference. The OMED 2018 Conference is an annual osteopathic medical conference that brings thousands of DO physicians, residents and students together to champion the profession, learn and network. Emily worked to establish a symposium that addresses the diversity crisis in medicine. Numbers for men of color applying for and attending medical school are increasing year by year, but the numbers are drastically lower compared to the total number of applicants and matriculants. The symposium purpose is to implement and share an action plan to encourage increasing diversity within the medical field. It is geared to educate physicians, executives, and student leaders of color on how they can help resolve this crisis through mentorship and representation. Prospectively, we hope this acts as a gateway to future events that target other issues in medicine that stem from gender or racial inequality. Keep up the outstanding work, Emily! ARE YOU READY FOR THE DREW SCHOLARS INDIANA vs. MSU TAILGATE? Wear your team jersey or Drew apparel and come make memories around the grill! We can't wait to see all of our alumni, faculty, staff and scholars. The tailgate will take place behind Rather Hall in the Brody Neighborhood! See you there!